I was a bit apprehensive about posting this for fear it may come off as wishy washy, but I truly believe in the law of attraction and wanted to share it with all of you! I discovered the law of attraction one day while browsing YouTube. 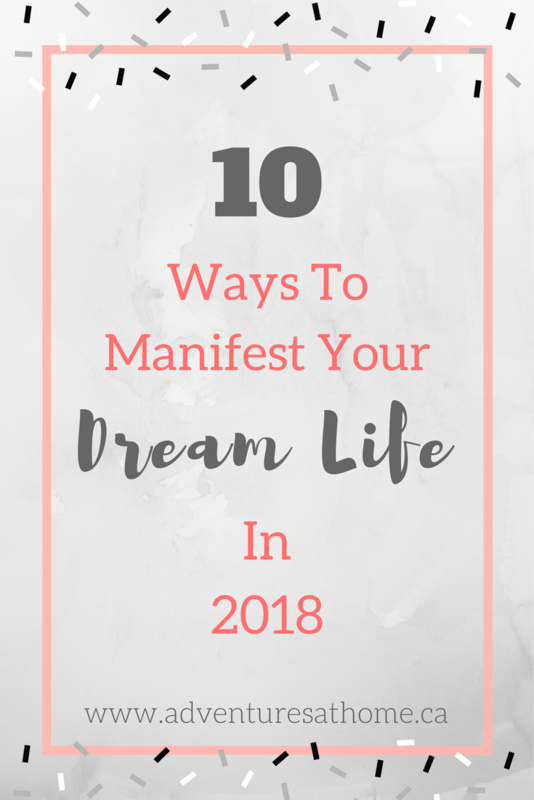 I had always been into making vision boards and the power of positive thinking, but I had no idea how powerful the law of attraction and manifestation could really be until then. The concept that thoughts turn into things and that we have more control over our lives than we think is so fascinating to me. The moment I really started believing is when I saw the law of attraction work for me earlier this year. In Spring of 2017 I was at a turning point in my life career wise. I had quit school because I was no longer enjoying the program I was taking, and decided to put my all into my blog and writing. After finding a few YouTube videos on manifestation, I decided to make a vision board. My vision board consisted of a photo of money, a photo of a MacBook, a job posting that I wanted, a photo of a family of vacation, and a photo representing health. Within a month, I got the job from the posting that I had on my vision board. By the end of Summer I had gotten my MacBook. I said a money mantra every day and started seeing money show up in the weirdest ways. In one week after saying my money mantra daily, we got an unexpected cheque in the mail, I found a cheque in a pile of junk mail in our kitchen that was dated a month earlier (a cheque for over $100 from our insurance company that I must have missed), and I had the person in front of me pay for my coffee order at the drive thru TWICE in one week! I could go on and on about the law of attraction and how it's effected my life (and I can go on further in another post if there is interest), but for this post I want to give you TEN ways you can manifest your own dreams in 2018! This is the first thing I did, and the beginning of a new year is the perfect time to make one! There are several different ways you can make one, but my favorite is a digital vision board. I made a collage on my phone and saved it as a screen saver so I see it every time I go on my phone. You can also make a physical vision board by pinning images to a corkboard or gluing images to a poster board and hanging it in your office, bedroom or area of you house that you walk by often. Looking at it frequently will remind you of what you really want in life, which will guide you to achieving those things. If you're trying to manifest money, make sure to be generous with the money you have. Donate to charities, pay for someone else at the drive thru, etc. Abundance attracts abundance, and you get what you give. If you are generous with your money, it will keep coming back to you. This is the same for anything you want to manifest- happiness, love, kindness etc. When sending our mantras and positive thoughts about something you want to manifest, make sure you're being specific. If you need a certain amount of money, make sure you are stating the exact amount that you need. For example, over the Summer, I wanted to manifest $3000 by the end of August. I wrote on a piece of paper "I am receiving $3000 by August 30th", and tucked the piece of paper away. By various means (extra pay at work, surprise cheques, etc) I did receive the $3000 by August. Be specific with both what you want and the date you want it by. Journaling is a wonderful tool for manifestation. You always want to write as if you already have what you want. If it's a job for example, instead of writing "I want to work here", write "I am working here..." Think of how working there will make you feel, what your desk will look like, what your office smells like, etc. Be as specific as possible. Once you're done, don't dwell on what you've written, just wait for it to happen. Dwelling on it will bring up negative thoughts of "Ugh this isn't going to happen" when it doesn't happen instantly. Just be patient and know that the universe will bring you everything you deserve. This is something I'm still working on, but I'm getting better at it. If you take care of what you already have, it raises your vibration and allows you to attract new things into your life. Why would the universe give you a new car if you can't take care of the one you already have? Keeping things clean and tidy will also just make you happier and create a better flow of energy. A huge part of the law of attraction is thinking positively. You attract what you put out, so if you're always giving off negative energy, you're going to attract negative things. After a couple of days of saying these, I almost always get an unexpected amount of money, whether its an unexpected cheque, a bonus at work, winning a gift card, etc. Check out YouTube videos, blogs, books etc about success stories with the law of attraction and manifesting things. I watch videos several times a week about manifestation and positive thinking because it helps improve my mood and hearing success stories helps empower my mantras and writings. I've been trying to get my family and friends on board with the law of attraction for months, but many of them quit when they don't see instant results. Positive thinking and manifestation isn't going to work for every single thing you try to manifest. Some things are going to take longer than other's, or some things may not be in the cards for you. For example, as hard as I try I may not be able to manifest winning the lottery because that might not be the plan the universe has for me. Make small attainable goals and try to manifest those first. Try things like asking for smaller amounts of money, a new job, a certain item that you really need, etc. Every time you get something that you really wanted, make sure you show gratitude, and look around you and show thanks for the things you already have. If you don't appreciate what you have, why would the universe give you more? Showing gratitude also just makes you feel good about what you've already accomplished and what you have in your life. Comment below and tell me if you believe in the law of attraction, and if you've been able to manifest anything! I would love to hear your stories! This is such an interesting article and a great way of thinking entering a new year! I too believe in the power of positive thinking. I like how you suggested to be generous, we are always trying to “pay it forward” in someway! My favorite is the vision board and writtinf things down. I do these two often. I strongly encourage vision boards as a way to organize goals. 15 New Year's Eve Party Ideas For Kids! Homemade Peppermint Vanilla Ice Cream!